Paul Menard and the No. 21 Menards/Sylvania team rolled to their third-straight top-10 starting position for a Cup race at Bristol Motor Speedway with a ninth-place effort during Friday evening’s qualifying session. 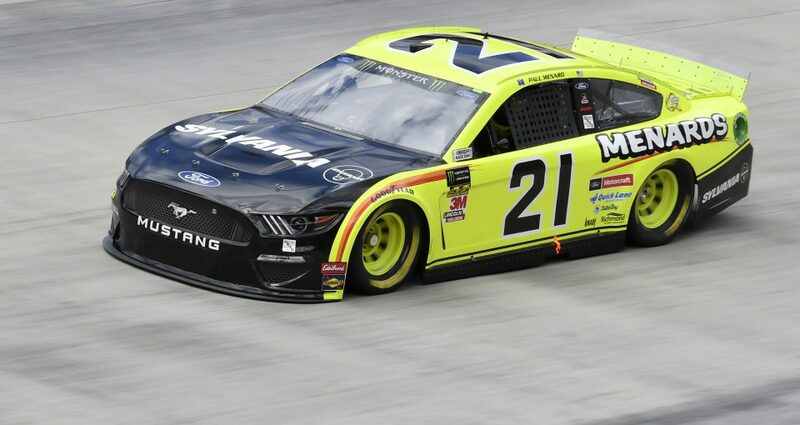 Menard, who qualified seventh and fourth for last year’s Cup races at Bristol, started the Food City 500 weekend by posting the 22nd-best speed in the opening practice session with a best lap at 127.022 miles per hour. He picked up speed considerably in the first of three qualifying rounds with a lap at 129.465 mph, which was 18th best and good enough to advance to the second round. The next time out, he gained a few more ticks of the stopwatch, posting a speed of 130.504 mph, which was 12th on the speed chart, and once again sufficient to advance to the next round. In the third go-around on the high-banked, concrete half-mile, he posted a speed of 130.026, ninth best and placing him among the seven Mustang drivers who qualified among the top 12. “It was a solid day, a good starting spot,” Menard said in his post-qualifying comments to the media. “We were just too tight in practice and freed it up, but we needed to go more because we were too tight again in qualifying. Two practice sessions are scheduled for Saturday morning, then the Food City 500 is set to start just after 2 p.m. on Sunday with TV coverage on Fox Sports 1. Sign up for the latest news and race weekend updates from The Wood Brothers and NASCAR. COPYRIGHT 2019 WOOD BROTHERS RACING. ALL RIGHTS RESERVED. WOODBROTHERSRACING.COM is part of the NASCAR Digital Media Network.